Over the years, we have built an outdoor skating rink for mass skating with an area of ​​20,1 thousand square meters. Meters, which has no competitors in the world. "Russian Ice Development" - the main designer and builder of open ice rinks in Moscow Parks: VDNH, Gorky Park, Babushkinsky Park. We are responsible for the reputation for the quality of ice, the purchase and operation of refrigeration, design and engineering solutions. Since 2014 the Russian Ice Development company is engaged in design, construction and operation of The Country’s Main Ice Rink at VDNH. 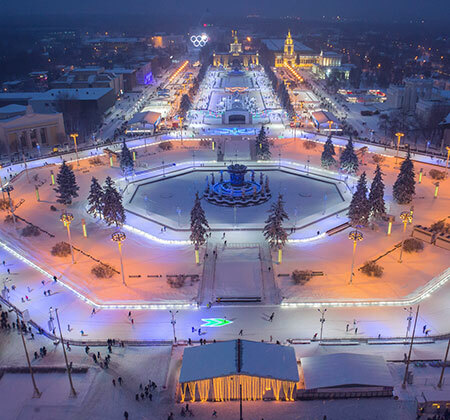 The Country’s Main Ice Rink occupies the whole Glavnaya Avenue with Friendship of Peoples Square from the Central pavilion to the Agriculture pavilion. The total area of its ice surface is apprx. 20100 m², and more than 67 thousand m² with infrastructure. Thanks to impressive size 4,5 thousand people can skate freely and have a rest from daily vanity there at the same time. 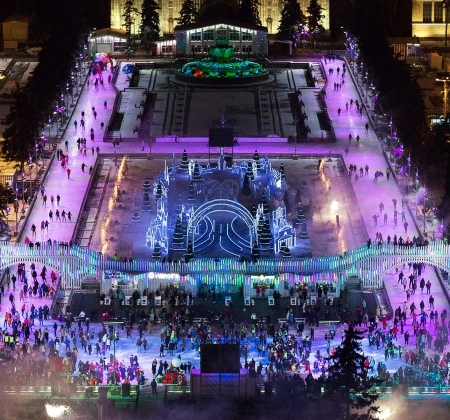 In 2016 the skating rink in Gorky Park celebrated its 5 year anniversary. The area of the ice surface is 18 000 m², infrastructure of the skating rink is extensive. There are 15 cash desks, 5 skates rental centers, 2 skating rinks (for adults and for children), hockey field, 2 schools (hockey and figure skating), cafe. 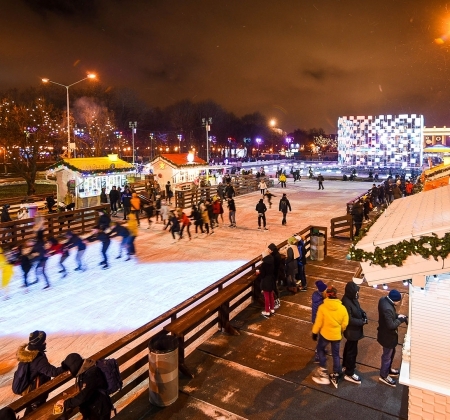 The subject of the skating rink changes every year and new elements for comfort of visitors and decoration of zones are added.